Private Internet Access (PIA) is one of the most popular VPN providers in the world. The company is based in Los Angeles, CA in the Untied States. In this VPN review, we will cover Private Internet Access’s features, server locations, security, price, connection speed and customer support etc. Desktop client only supports OpenVPN (PPTP and L2TP/IPSec can be set up manually). Private Internet Access has over 2800 servers in 20 countries, including Untied States, UK, Canada, Australia, Netherlands, Switzerland, Sweden, France, Germany, Ireland, Italy, Russia, Romania, Turkey, Hong Kong, Singapore, Japan, Israel, Mexico and Brazil. 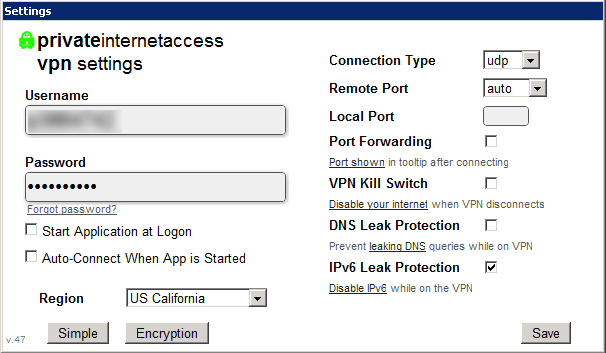 PIA supports the following VPN protocols: OpenVPN (TCP, UDP), L2TP/IPsec, PPTP and SOCKs5 proxy. Private Internet Access doesn’t keep VPN traffic logs. In addition, PIA accepts Bitcoin as a payment option, which provides further privacy protection for paid users. Private Internet Access does not limit bandwidth. It allows users to switch server locations as they wish. Also, PIA does allow P2P/Torrent and VoIP (many VPN providers don’t allow P2P/Torrent). For simultaneous connections, while many VPN providers only allow 1 device to use their VPN at a time, Private Internet Access allows you to use their VPN service on up to 5 devices at the same time. This is a very generous offer. Private Internet Access offers three types of payment plans: $3.33 per month if paid annually, $5.99/mo if paid per 6 months and $6.95 per month if go with month-to-month. 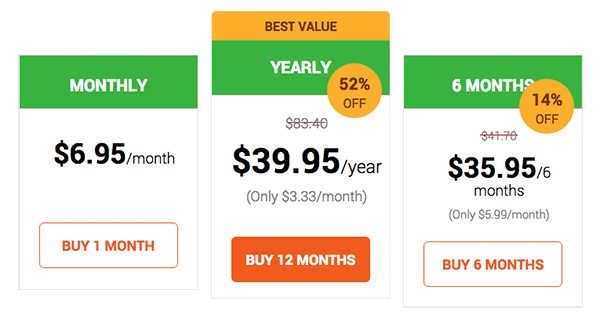 When compared to other VPN providers, PIA’s VPN service is definitely one of the cheapest ones. PIA offers a 7-day money back guarantee for users to test out their VPN service. Private Internet Access provides free VPN software for the following operating systems: Windows, MacOS, iOS and Android. In addition, its VPN can be set up manually on the following operating systems: Windows, MacOS, iOS, Android, Linux and supported routers. PIA’s windows and Mac clients only support OpenVPN, but users can set up PPTP and L2TP/IPSec manually. For our testing, we downloaded Private Internet Access’s client software for Windows. The installation process is straight forward and the software interface looks very minimal (see picture below). By default, it’s showing as the simple view, in which you can enter your username, password and set up some very basic options. If you click on the “Advanced” button, the interface will expand and more options will show up, including connection type selection, port selection, options for port forwarding, VPN skill switch etc. After you have entered/updated these setting and have clicked “Save”, the client software will minimise itself. To connect or disconnect, you need to click on PIA’s small icon on Window’s status bar. After you have right-clicked it, you will see options for connect/disconnect as well as a list of service locations to choose from. Ping: 14 ms, Download: 46.22 Mb/s, Upload: 16.16 Mb/s. Ping: 42 ms, Download: 3.42 Mb/s, Upload: 30.42 Mb/s. On Private Internet Access’s website, there’s a live chat window where you can connect directly to PIA’s customer support team. We tried using this method to get support. However, we found there were a queue of waiting customers and we had to wait for about 2 minutes before we were able to chat with a support representative. Once we were connected, we were able to get our questions answered. As one of the most popular VPN providers, Private Internet Access provides stable VPN connections and multiple worldwide server locations and easy to use software. PIA’s VPN speed is not among the fastest ones we have tested. However, their price is lower than many other VPN providers and their limit on the number of simultaneous connections (5 devices) is higher than those from other VPN providers (1-3). If you are looking for a reliable and at the same time cheap VPN service, you can consider Private Internet Access.